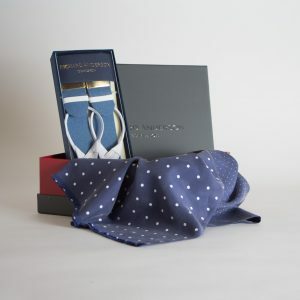 The Richard Anderson accessories collection continues to grow with silk handkerchiefs, our wool and cashmere scarves, and our new range of cufflinks, fine leather goods and beautiful belts; they are all made exclusively for Richard Anderson in the United Kingdom. We welcome you to view our constantly changing collection of accessories on our web site, where they are all available for purchase and delivery to your home. Made in England exclusively for us and marked with our name, our beautiful hanks are made from rich silk, with paisley motifs and geometric patterns that are visually interesting and allow these beautiful silk squares to be worn both formally and casually.